I love teaching vocabulary. I think that I introduce words in context and introduce them in a fun way so that my students are interested in learning the words. And as we review at the end of the semester, most of my students say, "Oh, I remember all those words" which tells me that the vocabulary sticks with them. A lot of these games and activities can be altered to work with grammar. I got this game from my students when I took over for a maternity leave. They played it with their main teacher and asked if we could play it. So they explained the directions and we went with it! I like it because it makes sure ALL of the kids are paying attention at ALL times. You need: White board space and two markers and clear aisles in your room. There are two teams. Let's say you have 24 students in your class. Each team will have 12 members. The two teams go head to head. On each team, each student gets a number, 1-12. Once each student has their number, it's game time (yes, this is NO PREP). Say out loud some vocabulary word in English. Give them a few seconds to process, the call out a random number in Spanish (example: tres!). The student from team 1 who is "tres" and the student from team 2 who is "tres" both run up to the board and write the word in Spanish as fast as they can. Whoever writes it first gets the point. I usually play to about 15 points (20-25 minute game) and I usually give candy to the team that wins. You can do this with conjugation, too! Just say "Yo bailar" and they write "bailo." Lotería is bingo. Simple as that. The picture to the left is how I play it. I give them words to choose from at the bottom so that they can fill in the blank spaces, and it doesn't take that long because they only have a few to choose from. I fill in some of the squares with pictures before I copy the sheet. When we're playing, if I say "La banda escolar," they would put their colored chip (from Amazon) on the picture of the school band. If I say "the team" they put their colored chip on the word "el equipo" if they wrote that one in. I do this to START a unit a lot of times, because it introduces them to the pronunciation of a lot of words before they have to produce them themselves. This game is thanks to my HS Spanish teacher, Sra. Hammen! We played it all the time and I loved it. It can be played two ways: Whole class (described here) or in Partners (described below). You need two fly swatters. I would NOT recommend playing this way if you have a SmartBoard. A screen with a projector works just fine though. You can also do this your chalkboard/dry erase board. 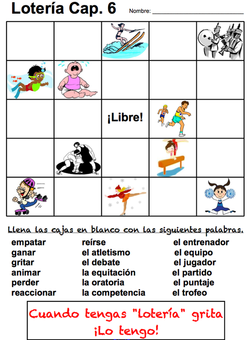 Put a ton of different vocab words in Spanish up on the screen or board. The more words, the more difficult it is. Split the class into two teams. Have a student from each team come up to the board, and say a vocabulary word in English and they need to race to hit the vocab word on the board (can also be done with verbs, as pictured above). Then they pass the fly swatter to the next student. Everyone needs to go once before a student can go again. The team that hits it first gets the point. Alternative: I did this during our body unit in Spanish 2, the day after my students traced a classmate on a big piece of butcher block paper and they labeled the body parts with post its. I took the post its off and put 4 bodies up on the wall around my room. I would say "La mano" and they had to hit the hand. We had 4 different games going at once and students were playing in teams of two or three, so they were much more engaged and involved. If you have 150 students, you will need 75 copies of this sheet. They work in partners. Students play against each other and find the vocabulary word with their finger. They tally points as they go. I often play this with pictures (as shown to the left) so that I can say everything in Spanish -- that almost works better! It's a lot of fun and sometimes they get crazy, so be prepared to tape some of the sheets down to the desk so that students don't "cheat" and pull the paper away from their partner! For this game you need teams of 4 or 5. For my explanation, pretend they are in groups of 5. They can be sitting in "pods" (I have my desks in groups of 4) or they can be in rows, both work just fine. Each student in the group needs a number (1-5). If they are sitting in pods, have them number off clockwise. If they are sitting in rows, the person in the front is #1, the person in the back is #5. Each team needs one small white board, one dry erase marker, and one eraser or rag. This requires a little prep. Make a 7-10 screens in PowerPoint or Smart Notebook. On each screen, write 5 different vocabulary words (because they are in groups of 5). When you put the screen up, person 1 needs to write "El tocino," person 2 writes, "Los huevos," person 3 writes, "El jugo de naranja," etc. Once all 5 words are written on the board, they hold it up. Whoever gets it up first and has correct words and spelling gets a point! The team with the most points at the end wins. If you have an uneven number in a group, have one person write down 2 of the words, or pull one student and have them be your helper to check for accuracy and to look to see who holds the board up first. My students love this game. They work in groups of 4. Each group needs a sets of about 20 vocabulary words OR pictures printed out. I print mine onto colored cardstock - try to make the cards at least 2" x 2" and laminate them so that they last. They spread all the cards out, face-up. 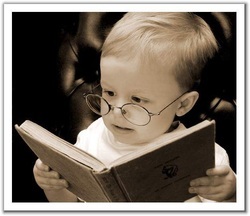 When I say, "Leer," they need to find the picture of the kid reading as fast as they can, and grab the card before the other group members do. Whoever grabs the card keeps it. At the end of the game, whoever has the most cards wins (candy, a little prize, whatever you want). If you make the cards with vocabulary words, rather than pictures, these cards can be reused for the game 30 Segundos, described below. This idea is from The Creative Language Class. See the original post here. I used this game to review food descriptions after we talked about describing food as sweet, salty, hot, delicious, etc. We also reviewed colors, shapes and sizes before playing this. Students play in groups of six (two teams of three). I ask students to use timers on their phones or iPods, because in each group there's at least one student that will probably have a phone with a timer. 1. 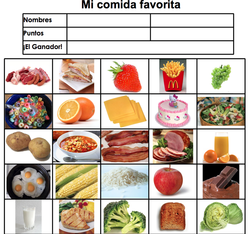 One person will draw a card that has a vocabulary word in Spanish on it. 2. The other team gets to see the card too. If the person describing breaks any rule, they buzz them on it and they get the point. 3. The team of the student who picked the card tries to guess the vocabulary word in the target language. The student who picked the card has to describe it completely in Spanish. If they draw "El tocino," they would say "Es una carne, es caliente, es para el desayuno, es riquísimo." The students on the team have 30 seconds to guess what word is being described. If they get it, they win a point. If not, their turn is over. 4. After their turn, the next team goes. 5. They should rotate who describes each turn and the team who gets the most points wins! I do not like teaching grammar. I feel like this is when kids get frustrated and when I get frustrated... 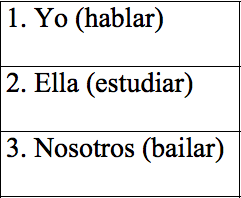 I do have a couple of activities that help students practice conjugating when we're working with a new tense (or type of verb in Spanish 1). 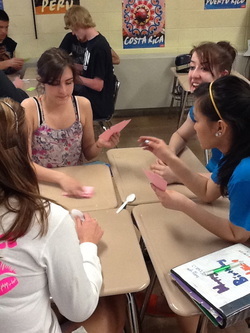 Spoons, the classic card game, can easily be made to play in Spanish to review verbs (or vocabulary!). The goal of the game is to get "4 of a kind," and when you do, you reach for a (plastic) spoon in the middle of the table. In a group of 6, there are only 5 spoons, which means the last person to reach for a spoon is "out." With my Spanish 3s, when we were learning the future tense, I made a set of about 50 cards for each group. I printed each set of cards on colored cardstock so that if a card falls on the floor, you know which game it belongs to. A "set" consisted of (for example), "Estaré" "Estarás" "Estaremos" and "Estaréis" - or 4 conjugations of the same verb in the future. My kids had a lot of fun with this and asked to play again sometime soon! With my Spanish 1s, when we were working on ir verbs, I made a set of about 40 cards for each group. In this version, a "set" consisted of (for example), "Escribir," "To write," "Escribimos" and a picture of someone writing. I used about 10 different verbs. would let them play for 15-20 minutes. This is a great way to practice conjugation. A little lame, and maybe not "best practice," but if your kids are struggling with remembering how to conjugate, this is a great way to spend about 10 minutes. You need to make 25-30 strips of paper that are numbered. On each strip of paper, write a subject pronoun and a verb. For an example, see the picture to the left. Each student starts with one strip of paper. On a sheet of notebook paper, they write down the number and the conjugation. So if they get 1. Yo (hablar) they will write 1. Hablo on their paper. Put up a timer from online-stopwatch.com (or I hook up my iPad to the projector) and put on some music. They need to conjugate quickly (I usually set the timer for 20 seconds or less, they will BEG for me to make it faster and faster as we go on). When the timer goes off, they pass the strip to the next student. Tell them exactly where to pass the paper before you begin, or it turns into a big mess. I usually have them do 20 conjugations - it keeps their interest for that long. As an extension, they can check their work with a partner sitting near them and I usually have them hand it in and enter it as a completion grade while checking for mistakes. 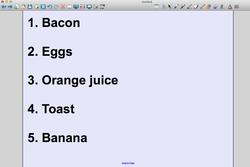 You can also do this to practice working with gustar and nouns. I made cards that had pictures of different foods and on the card I also put a post it note that had the number and the subject pronoun. They need to write, for example "Me gusta el tocino" if they get a picture of bacon and a post it note that says "Yo,"
This game takes a LONG time to create (summer project?) and a little bit expensive, but once the game boards are done and you've purchased the pieces, it is a 100% no prep activity and great for the days that you want a break but want the kids learning at the same time (we've all had those, right?). Credit for this goes to my cooperating teacher from student teaching, so thanks, Jen! Two different colors of dice. I bought these and these (teal) and these (white) from Amazon. They are mini dice but cute and my students love them. Game pieces like you use in the game Sorry! I bought these from Amazon. I store these pieces with the dice in an index card plastic box. Rules sheets. I copied and laminated two different rules sheets: One for when you play with VOCAB and one for when you play with VERBS. 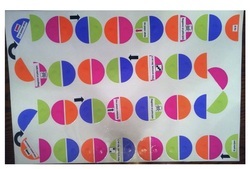 A circle paper cutter like this one (to make your life easier). You will cut out the circles and then need to cut the circles in half. Creating the boards takes a long time. 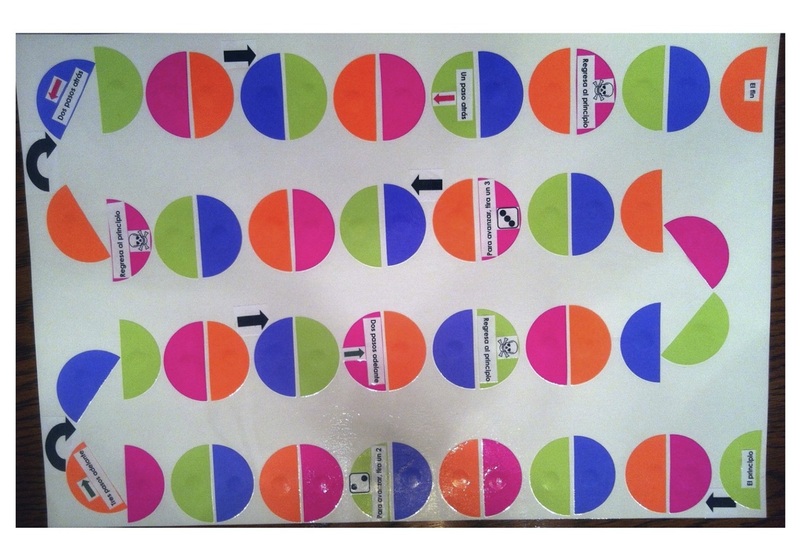 You have to cut out the colored paper, lay out the pieces, glue them down with glue dots, then add the words where appropriate, and then LAMINATE THE BOARDS! I can't stress how important the lamination part is. It's vital. I got this idea from The Creative Language Class. See their post here. I give my students cards that have conversation fillers and phrases (¡Qué guay! Em.... Bueno, Es de... ¡Qué chevere!) on them while they do this, because especially in level one, they struggle with speaking. I will usually put questions up on the board I'd like them to ask each other, and the questions relate to what we've been covering. This worked WONDERFULLY to help us get ready for a speaking assessment where they had to play both a waiter and customer in a restaurant! I started with the entire conversation written out of them on the board, and covered up two phrases each time. By the end of it, they could do the entire thing without notes and did well on our assessment!